What can we learn from watch faces? When are smartwatch apps going to take off like phone apps? Scroll through the Android Wear app store and you'll find countless watch faces and a handful of 'staple' apps that have been around almost as long as smartwatches themselves. But you won't find all that much else. Even some of the staples are starting to disappear, with eBay and Google Maps having quietly discontinued their Apple Watch apps. Where are the inspiring apps that will turn smartwatches into something that does more than telling the time, notifications and activity tracking? Ariel Vardi, co-founder and CEO of Little Labs, has something to say on the matter. You may have tried Little Lab's Facer app, the premier watch face store. It's available for Android Wear, Samsung's Tizen and Apple Watch, and features officially licensed faces stamped with Tetris, Ghostbusters and others as well as hundreds of user-made ones. It's well worth a look for any smartwatch owner and Wear wearers can now get a different watch face everyday with the new Daily Mix feature. Little Labs hasn't always been obsessed with watch faces. "We created a slot machine game for the Apple Watch when it came out, and worked in direct partnership with Fox to create the first triple-A game for Watch, The Martian," says Vardi. The Martian is a smart text adventure that can be played across your phone and smartwatch, and ties-in with the film of the same name. As you might remember, it was a big hit and picked up a fistful of Oscar nominations in 2016. Despite its novel idea and the brand injection, Little Labs' The Martian was not a great success, and on Wear has achieved just 1% of the downloads of Facer. "We quickly got to the realisation that today people do not use apps that much on smartwatches," says Vardi. A nimble developer with just six full-time staff in Venice Beach, LA, Little Labs didn't continue plugging away with smartwatch games. "The focus is on really, really quick interaction and to adapt ourselves to the natural behaviours of users of the watch." Talking to Vardi, it becomes clear that he believes the average watch user barely gets beyond the watch face despite "100 daily interactions" with the device, according to Little Labs data. "For now we still think the main opportunity is around watch faces. The rest, of what I'd call traditional apps you have to launch by tapping on an icon in an app menu, is not something that's happening a lot of smartwatches today. It might shift with Android Wear 2.0, it might shift with the next version of watchOS." Conversely, "the interesting behaviour we see is that people change watch faces very, very often. People get tired and change watches pretty rapidly… people do this multiple times a week based on our data." But why is smartwatch use so narrow? "In the first few years of the smartphone, ringtones and wallpapers are what mattered. It's the same thing here on smartwatches. And you saw how the mobile world evolved," says Vardi. There is hope. Now we are three years into this modern age of smartwatches, though, getting to the next stage of smartwatch app development seems long overdue. So why aren't we there yet? Vardi highlights two key problems: discovery and engagement. These and the basic issue that when we all walk around with phones in our pockets, "if the watch interaction is not stellar, users quickly ask themselves, why am I doing this?" "The other challenge for apps is that app discovery for smartwatches is pretty terrible," says Vardi. "It just leads to very, very poor discovery of apps in general and pretty low engagement because people forget they have apps on their smartwatch. The one thing they don't forget and use all the time is the watch face." Android Wear 2.0 makes positive steps, by adding an on-watch app store. Vardi sees this as a big improvement, arguing that downloading watch apps on your phone felt "disjointed". However, the problem is also deeper, and he singles out perhaps the least-celebrated of the big three watch platforms, Samsung Tizen, as making the best moves right now. "One example of better user experience for apps is what Samsung is doing with its Tizen operating system, where you have widgets that you can access very quickly by just rotating the bezel, and these widgets are fully interactive," he points out. "That's probably the best way to create an entry point for an app on a smartwatch. Having a menu with a bunch of icons like the Apple Watch is not the best UX to access apps. It's similar to what you have on a phone, but the user behaviours are very different." Vardi uses a Samsung Gear S3 himself. And, to my surprise, he says that Little Labs's user base is roughly an even split between watchOS, Wear and Tizen. Samsung owners seem more engaged: "From our window into the world, mainly through Facer, Tizen devices are doing pretty well. "The bezel and the way the OS is structured are also a better fit for the smartwatch," he continues. "The other operating systems today are still a bit too similar to what you see on a phone, and it doesn't make sense." So if something can't sit on the surface of a smartwatch, it won't get used. According to Facer's chief, what's missing is a "re-engagement hook". But what does that look like? "I think the watch face complications are going to do that quite a bit." Complications are the little watch face modules Google added to Wear with version 2.0. They allow developers to insert little app-linked interactions into watch faces. 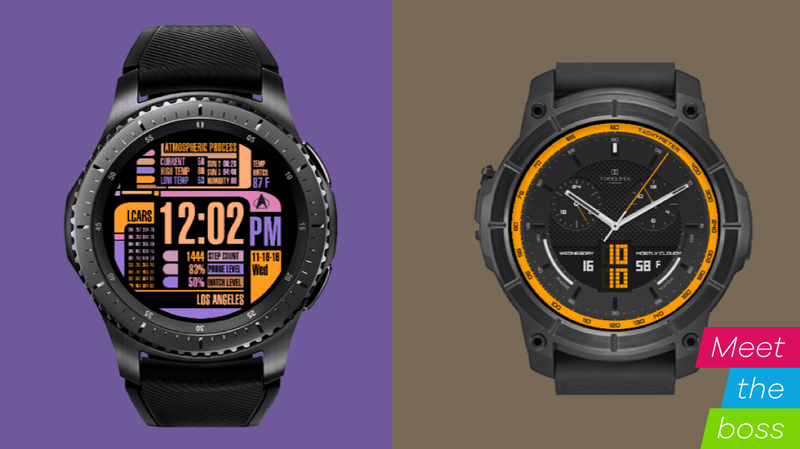 It might seem obvious that the developer of a watch face app would stress the importance of watch faces, but Little Labs sees itself as simply honing in on what works from a user experience perspective. It's reactive, not just milking an idea until empty with 25% of its bandwidth going to looking at other avenues rather than simply feeding Facer's success. "We're still very bullish on games," Vardi says. While the team isn't currently actively working on another game, he talked about how game elements could be baked into the watch face itself, citing AR titles like Pokémon Go and a simple one-touch slot machine — linking back to one of its earliest Apple Watch apps. The hope is to "drive deeper engagement" currently missing in the day-to-day smartwatch experience. For now, it all comes back to the surface of the watch. But Vardi hopes Apple will once again act as a "catalyst for change" later this year. "It's going to be very interesting to see what Apple does next. What is this next watch going to look like, and is there going to be a significant change in watchOS?" Little Labs is waiting. Always keen to jump on new platforms, Little Labs is also currently researching the potential for voice-driven apps through devices like Amazon Echo. "The common thread for these devices, these new interfaces, is that they are new entry points into apps," says Vardi. "The core theory behind everything we're doing is that the traditional model where you have apps on your phone and you tap on the icon to launch them is slowly crumbling." At this point in our chat there was an awkwardly long silence as my brain tried to work out what a voice app would feel like, what it would do. As someone who finds talking to Siri as awkward as a first date in a tube train carriage, it's not something I immediately look forward to. Vardi and I are quite different, though. "I have an Echo Dot and a regular Amazon Echo as well in multiple rooms in my house," he says. "I use this very, very often. There's a huge opportunity there, for games as well. It's mostly going to be, in the first phases, quiz types of games or interactive stories, a bit like The Martian." He does, however, foresee a similar kind of adolescence as that of smartwatch apps. "The challenges are similar to what we see on smartwatch and frankly iMessage as well. All these new platforms suffer from challenges of discoverability of apps, and it's worse on these voice activated devices because there's no visual. You don't "see" the icons, and there's no way for Alexa or Siri to tell you about apps in a way that's not super-annoying," says Vardi. As a developer "dedicated" to smartwatch, with some side projects in iMessage apps, Little Labs hasn't taken the easiest, shortest route to make money off apps. For the sake of the smartwatch app scene, we should hope developers like Little Labs continue plugging away.